Welcome to tibetanart.com - the website of the British artist and author Robert Beer, who first began to study and practice Tibetan Art in 1970. Showcased in galleries are masterpieces of Tibetan Buddhist and Hindu Tantric art painted by the finest contemporary thangka painters and Newar artists of the Kathmandu Valley. The main purpose of this site is to reveal the incredible skills of these artists by making their original works available as fine-art Giclee Prints, which are all meticulously accurate in their iconography, colour fidelity and detail. Each painting has a precise description written by Robert Beer, who is working with a master printer to individually produce these archival prints. Also exhibited are the exquisite visionary paintings and mandalas of John F B Miles, along with other deity prints and postcards. Essentially the artists themselves are represented here as some of the most spiritual and divinely inspired painters of our time. 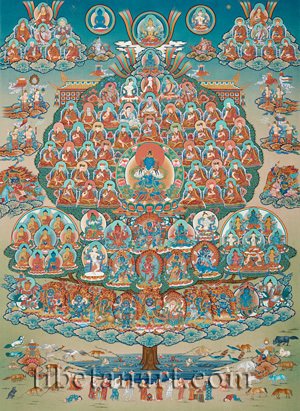 This thangka, painted by Chewang Dorje in 2003, depicts the Nyingma Refuge Tree or Merit Field assembly that is visualized in the ‘Preliminary Practices’ (ngondro) of the Dudjom Tersar or ‘New Treasures (tersar) of Dudjom’ tradition, which were revealed relatively recently by Dudjom Lingpa and his successor Dudjom Rinpoche. Padmasambhava is said to have composed this concise practice, along with other related practices in the early ninth century, before concealing them as hidden treasures (terma) that would be revealed in a more degenerate time when people had less time to practice the Dharma. 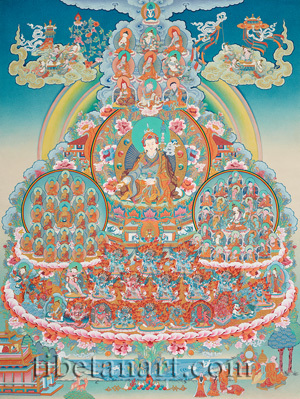 This rare thangka portrays the complete assembly of the twenty-one Taras according to the tradition of the early Indian Buddhist master, Suryagupta. There are three main traditions that depict the twenty-one Taras, the first being the Nagarjuna and Atisha tradition, where all of the Taras are virtually identical in appearance, except for their body colours and the colours of the vases they hold in their lowered right hands. The second is the Longchenpa tradition, where all twenty-one Taras are also similar in appearance, except for their individual attributes that rest upon their left hand-held lotuses. 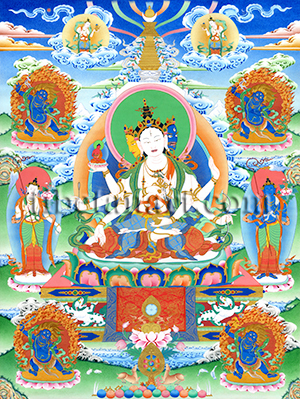 And the third is the Suryagupta tradition, where each Tara appears in her own unique form, as represented here. 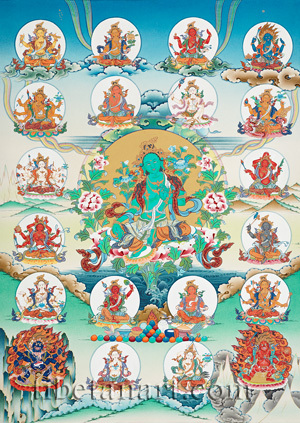 The assembly known as the 'Eight Medicine Buddhas' (Tib. 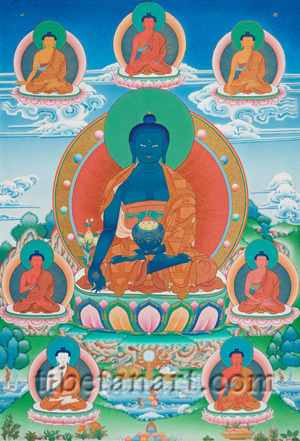 sman-bla bde-gshegs brgyad) shows the principal form of Bhaisajyaguru, the 'Medicine Guru' or Medicine Buddha, surrounded by his 'Six Brothers' and Shakyamuni Buddha. All eight of these figures wear the three red monastic robes of a nirmanakaya Buddha, and sit in vajra-posture upon a moon disc and lotus, with only their specific colours and right hand gestures differentiating them.